Eaux Claires Music & Arts Festival is coming up on its third year, or “TROIX” as it refers to itself. The “Arts” portion of the festival added a lot of magic to our experiences the first two years and we wanted to dig a little deeper into this year’s lineup of visual art. The fest announced over 20 art installations, “which are as integral to the collaborative weekend as the festival’s musical lineup.” More than just an Instagram opportunity, Artistic Director Michael Brown seeks to engage festival-goers and create an immersive experience. Part open call, part commission, and part word-of-mouth, the artists were selected to best fit the vision of the festival. Michael Brown took a break from his work as the touring Production Designer for Bon Iver and The National to take a call with Radio Milwaukee to talk curatorial process and what we can expect from the artistic elements of Eaux Claires this year. 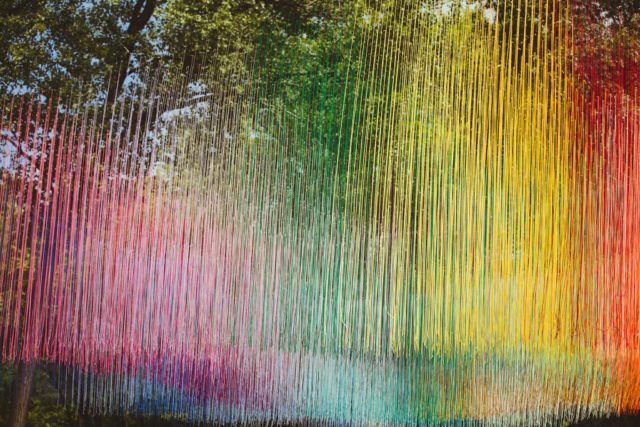 Can you explain the vision for the art of Eaux Claires? Essentially what we’re trying to do is show Art is important in society and culture because it makes you expand your horizons a little bit and makes you think about things differently and puts you in a different mindset. That’s one reason why art of different genres is so important to the festival. It puts people into a different mindset of this accepting creative environment. Seeing a writing, seeing a painter, seeing an installation of a different type makes you that much more accepting and willing to suspend your disbelief towards the rest of the music and everything else. It’s more about creating this culture of creativity happening around you in all different shapes and forms. It’s also important for us at the festival to strive, this is not exclusionary creation, we want people working in all kinds of art forms to be there, expressing and creating. That’s kind of become the mission statement in a short, not-so-eloquently-spoken way. How would you convey this to people who haven’t been to the fest? How has it grown since previous years? With this year, more than others, we’ve taken more time to talk about it. In year one and two, it was an important part of the festival, but we didn’t have enough of an organization to talk about it as well as we did. In year two, we spent so much time talking about the musicians; we felt that everybody deserved to have the same kind of coverage. This year, we’ve tried to democratize that entire process. That’s why, people are saying, “Oh my gosh you’re talking about it so much.” Well, hey guys, this happened in year two, this happened in year one, we’re becoming much more formalized in trying to give equal billing. I’m sure these artists work hard and have a big vision, I’m sure they want it to be more than something you walk by and take an Instagram picture of. Yeah, and sometimes I have conversations with people who say there are massive installations at Coachella. Yes, I was at Coachella and there is a single installation on a huge scale well beyond our entire budget, but there is a feeling that you aren’t interacting with it. There is a feeling that it’s just an Instagram showpiece, a decoration rather than a piece of art. Almost like the music program is the curatorial vision of Justin [Vernon] and Aaron [Dessner] they talk and a lot of it is super organic with the other musicians. That becomes a formalized project that we announce to the public. That same process happens in the art as well, a lot of people wanting to collaborate and work together. ...it’s a small very dedicated pet project of people that want to create a platform to have one super exciting weekend in the summer where we all come together, have a meaningful experience that can inspire us through the rest of the year. The art feels very site-specific. Were the artists assigned an area first or did they have a vision first and then figured out how to fit that to the space? It’s more of, once everything is put together and all the projects are assigned, I just take a look at the map and say, “you know, I think people are going to get the most benefit of the grounds here.” Or there needs to be a reason to go to this other area or also spread people out, so there are a lot of different factors that go into it. On the broad strokes, it’s more like, “Oh, this would be great to experience out in the woods or great to experience along the river. There are those kind of decisions being made. That sounds like a really intimidating endeavor. The other funny thing is a lot of people think about the festival and they’re like, “Aw man, you have this army of people.” And we’re like, “No we don’t.” The art program is put together me and my assistant Trace and that’s our army. We work with our small graphic design team to get it all together. That’s one of the big differences between our and other festivals is this is a labor of love. This is not some large corporation trying to create this large capitalistic entity trying to take over the world. It’s almost the opposite, it’s a small very dedicated pet project of people that want to create a platform to have one super exciting weekend in the summer where we all come together, have a meaningful experience that can inspire us through the rest of the year. The artists aren’t just Midwest-based. Did artists come to you or did you put a call out? We do an open call and we get a lot of people that participate in the open call. I would say a quarter of our artists are from the open submissions. A large part of it is networks of people that we know. They get their friends excited and their friends reach out to me or reach out to Justin and say, “Hey, I’ve got this friend that went to the festival last year and want to do it.” In a lot of ways, we’re just as excited about that as I am for open call. The open call is important, because we definitely don’t want this to be some exclusive experience. I want everybody to have an opportunity to share a great idea. Yes, we want to be facilitators, an entity basically that helps seed and fund and help the artist grow in general. It’s a double-edged sword because we definitely get a lot of people who submit an idea and when you say, “Hey thank you so much for submitting your idea, this idea really doesn’t jive with a lot of the things we care about as a festival” and they get defensive for not getting selected. That’s not the conversation we’re trying to create. Last year people asked, “Which artists are part of the open call?” I would never, ever, ever delineate an open call project from a project that was sought out and commissioned by Eaux Claires, because I don’t want to create different tiers of artists. We’re all a part of the same community now and there is no separation. It comes together as one entire vision. Chuck U’s line-heavy drawings of strange creatures in strange environments will be on display; festivalgoers will have the opportunity to color his works. Large scale mural artist Kelie Bowman, whose work Crescent Field explores the ephemeral qualities of light by shifting depth and distance in a still medium. Los Angeles based sound artist Chris Kallmayer is planning to amplify the sounds of 1,000 crickets to echo throughout the woods. The natural sound of crickets will point to the memory, the passage of time, and the poetics of place. A returning collaboration between choreographer John Mark and Eaux Claires infuses dance into the festival weekend. This year’s choreography is inspired by public service announcements from the 1960’s. Conceptualized by Los Angeles artist Davy Sumner, this percussive instrument creates a chaotic, spontaneous sound using electromagnetic force. The residual energies can be visually observed through the underwater setting. The Pickup Music Project, hailing from Boston, returns to the festival with a sound installation that creates music through falling water. The piece mirrors the organic, unpredictable nature of rain. Eau Claire-based artist Kevin Scheid will inflate balloons of different shapes and sizes during the musical performances. Guests are invited to get comfortable in a Midwestern living room right in the middle of the forest. The space includes a couch, vintage stereo console, and some impromptu listening sessions of unreleased music from festival artists and friends. Justin Orvis Steimer will create art in response to the musical acts. Festivalgoers are invited to channel their inner child by taking a visit to the Moms Booth, an interactive installation staffed with real moms from the local community, including mothers of artists at the festival, which also lends participants the opportunity to engage with the familiar notions of motherhood and see how they change from person to person. Artist Holli Jacobsen will collaborate with Lang Jacobson, Elizabeth Harclerode and Dagmar Beckel-Machyckova to create this interactive installation. Moss Cave invites festivalgoers to seek out the serene shelter of moss, only to return invigorated to the excitement of the festival. This immersive stage design creates a one-of-a-kind environment, using diorama-inspired structures, hanging elements, and hand-painted backdrops by Milwaukee artist Kristina Rolander. Minneapolis craftsman Keith Wyman seeks to suspend reality with this installation. Citing inspiration from his home and surroundings, Wyman utilizes non-traditional mediums, such as concrete, in order to create modern furniture. Returning sculptor Serra Victoria Bothwell Fels will debut a large-scale installation, inspired by fantastical blueprint drawings. Fels manages to seamlessly employ both folkloric, fairy-tale elements with an almost science-fiction architectural structure. This sculpture showcases architect Erlend Nuemann’s approach of creating minimal, yet complex forms infused with sculpture. Architect Erlend Nuemann will also create an aesthetically beautiful stage that naturally projects sound. Created by Michael Brown and Carl Faber, this light installation encompasses the entire grounds of the festival and features the works of guest video artists. Returning for the third year, The Banks alters how audience and artist interact with an emphasis on incorporating experimental video and audio elements. This year, the space will be an experimental venue-in-the-round, which is set amongst the woods and encourages audiences to move around and experience impromptu sets from multiple vantage points. Returning to the festival for the second year, this 8-foot tall, 40-foot wide 3D-mapped art installation turns into a dazzling light display filled with colorful animations once the sun sets. Based out of Minneapolis, MN, Burlesque Public Works Division brings a composition using three walls, built up of layers of painted typography and signage. Several authors of various backgrounds including Eau Claire native Michael Perry,will be scattered throughout the festival, offering festival guests five-minute readings from Mary Cutrufello, Patti See, Dean Bakopoulos, Alissa Nutting, Daniel José Older, Guante, and Eleanor Perry-Smith. Eleanor Perry-Smith will take the stage reading her poetry, which blends classic verse and contemporary grit. An invitation to look past the meadow’s mown grass to where things are a little shadier, a little more secret, and a little wilder. Tremolos is an installation by creative studio Intermedio from Cincinnati, OH that explores the enveloping structure and rich spatialization of sound through a multi-channel speaker. The piece generates a collection of sounds, modulated by spinning fans. We Were Seeds, by artist and illustrator Landon Sheely, utilizes print and other forms of media to create a landscape to be enjoyed by the public. A colorful mural by San Francisco artist Casey O’ Connell, which will make its public debut at this year’s festival following its private creation at Eaux Claires 2016. Performed by VNESSWOLFCHILD, this roaming and evolving art project piece is open to interpretation.